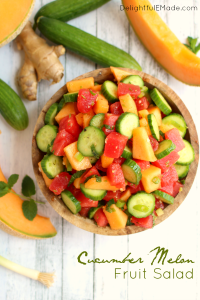 The perfect pasta salad or side dish for any pot-luck, picnic, cookout or backyard barbecue! 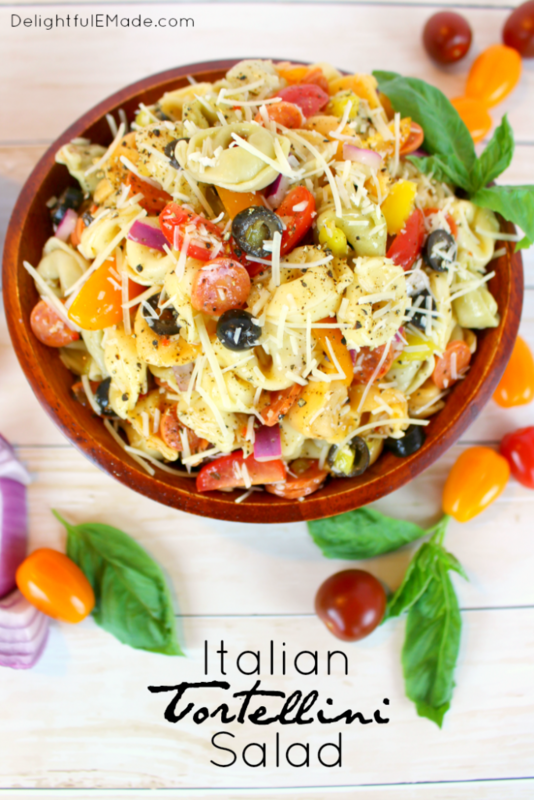 This delicious tortellini salad is loaded with all of your Italian favorites, like salami, tomatoes, olives, banana peppers, red onion, and topped with Italian dressing and shredded Parmesan cheese! 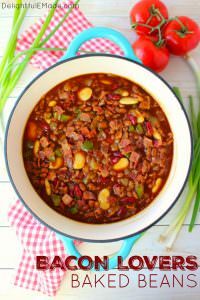 Growing up in the mid-west, pot luck dinners were always a community-wide event! Every home cook brought their best dishes, including salads, fried chicken, sandwiches and decadent desserts to share with everyone! The food was ALWAYS fabulous, and typically enough to feel the crowd twice over. 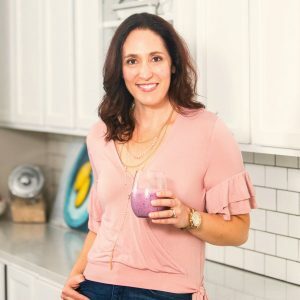 People NEVER brought store-bought food to a pot luck – that was a big no-no! The two unwritten rules of pot luck dining were always 1) bring enough to feed your family, and 2) bring something homemade. 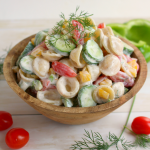 My tortellini salad would be the perfect dish to share for any pot luck event. 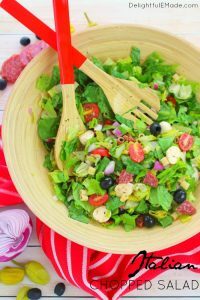 Loaded with fresh, delicious tomatoes, onions, peppers, olives, and mini-pepperoni, this salad could easily be a meal in itself. 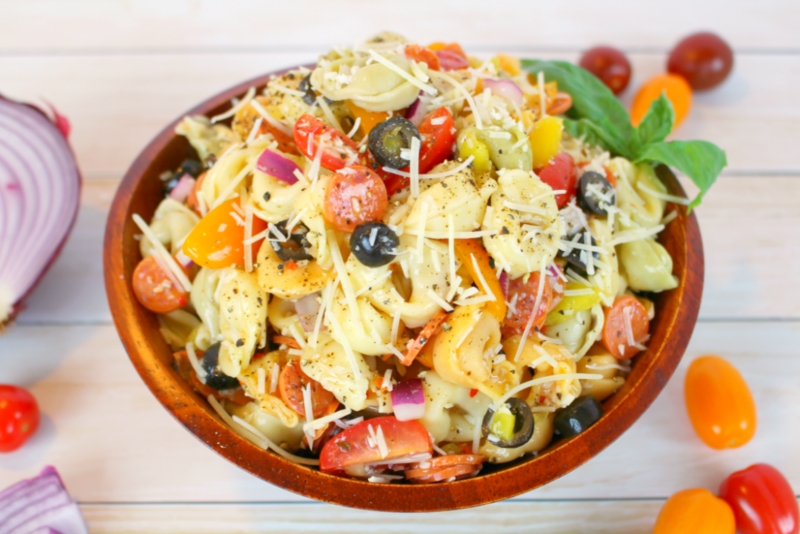 The tri-color tortellini pasta comes together wonderfully with the rest of the ingredients making an amazingly colorful dish. The shredded Parmesan cheese really brings the salad together and is complimentary to the cheese tortellini. I tend to use frozen pasta for this tortellini salad, however, if you have dry pasta that’s available to you feel free to use that instead. 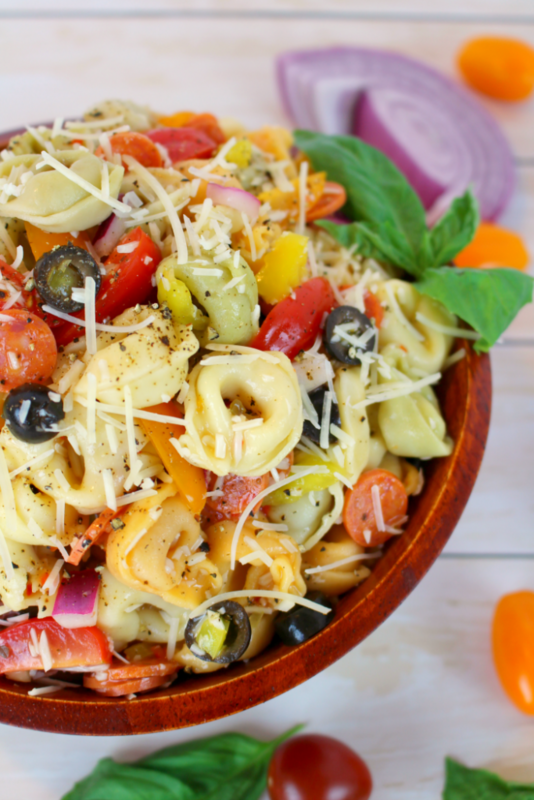 This tortellini salad is very simple to make, and comes together quickly and easily. Feel free to use a store-bought Italian dressing, as is coats the pasta and veggies well and adds a nice, complimentary flavor. It also brings all of the ingredients together, including the fresh vegetables, cheeses and pepperoni. 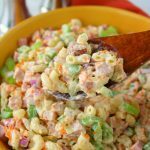 The perfect pasta salad for any pot-luck, picnic, cookout or backyard barbecue! 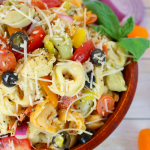 This delicious tortellini salad is loaded with all of your Italian favorites, like salami, tomatoes, olives, banana peppers, red onion, and topped with Italian dressing and shredded Parmesan cheese! 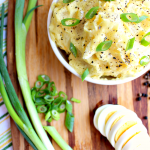 The ultimate side dish for any meal! Cook pasta according to package directions. Drain and rinse with cold water. Let set to cool. In a large mixing bowl, add the mini pepperoni, tomatoes, olives, red onion, and banana peppers. Toss with the cooled tortellini pasta. Add the dressing and cheese and toss all ingredients to coat. Refrigerate for at least 1 hour before serving. Serve chilled. This looks SO delicious! 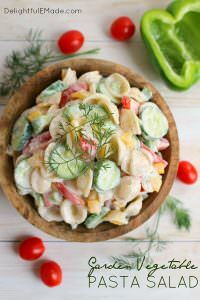 Pasta salad is my all time favorite, and adding tortellini is genius! This looks so good! 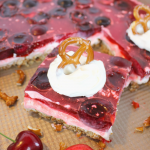 We're having my son's high school graduation party in June and this would be a perfect addition to our menu. Thanks for sharing. Over from SITS.. 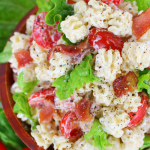 Your pasta salad looks so yummy. Thanks for sharing at the #InspirationSpotlight party. Pinned & shared. This is my favorite type of pasta salad. 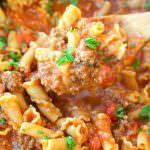 I love the use of tortellini! Thanks for sharing at the Shine Blog Hop! I've been so hungry for a salad like this! Trying this today, can't wait! Thanks, Erin. 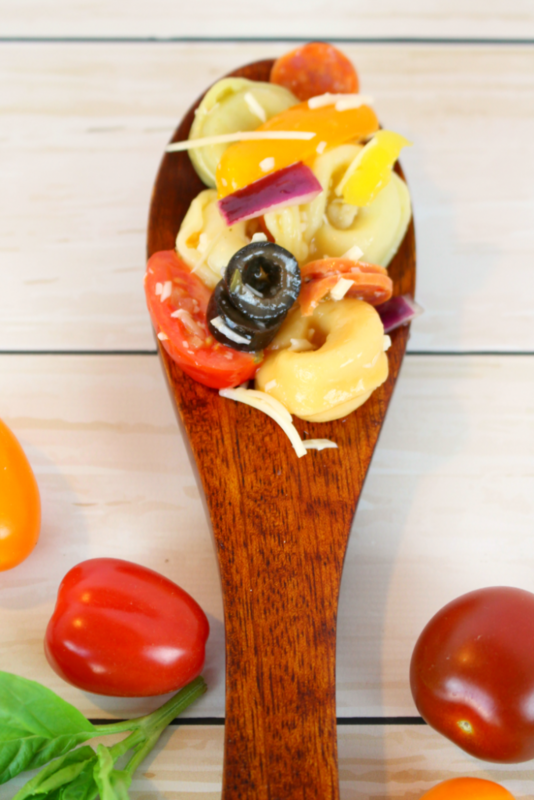 I love pasta salad and I love tortellini - a perfect match!! Thanks for sharing at the What's for Dinner party! This is a delicious stand-alone meal. It looks so good.